On Facebook, Twitter, and other social networks, it is very easy to “unfriend” someone. For some reason it is very difficult to figure out how to delete connections on LinkedIn. If you think about it, LinkedIn was originally intended to be a social network for professionals who only connected with people they know and trust. But, similar to other social media, users today are more open and might connect with someone on LinkedIn that they might not know too well. This is similar to how they might follow someone who seems interesting on Twitter or Instagram without personally knowing them. Sometimes, for whatever reason, we might want to delete a LinkedIn connection that doesn’t make sense anymore. After all, if you think of connecting to someone as their joining your virtual world, if the relationship does not work out because you feel you are being spammed or for another reason, you do have the option of removing them as a LinkedIn connection. Connecting with someone on LinkedIn is not a marriage by any means! Hopefully this gives those who want to build out a larger network or even those who want to start slowly connecting to people that you virtually meet on LinkedIn some sense of security in doing so. There are two primary ways in how to delete connections on LinkedIn. This is by far the easiest way in how to delete connections on LinkedIn. After all, there is probably an incident that makes you want to remove a LinkedIn connection, so inevitably you will probably end up visiting that person’s profile to make sure you want to remove them. If you are concerned that they might find out that you visited their profile, make sure you visit their profile with your privacy settings showing you as an anonymous visitor. 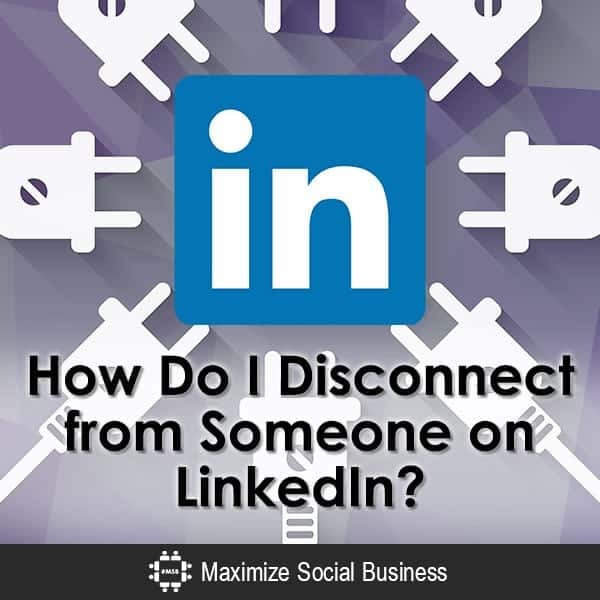 How to delete connections on LinkedIn if you already have a list of people you want to remove as a LinkedIn connection or you want to scroll through your LinkedIn connections and decide who to remove? This option is for you! You have the ability here to search for connections by either first name, last name, or the default recently added. For every connection you will see a Message button to the right followed by three dots. Pressing the three dots will provide you the magical Remove Connection button. Removing a LinkedIn connection through either of the above two methods will yield the same result. Your contact will not be informed that you removed them from your connections. Should your disconnected connection wish to invite you to connect again, even after you remove them as a connection, they will get an error message saying something to the effect that “This user cannot be invited at this time”. If they contact you directly about this be prepared to explain (I have been in the same situation in the past so you will have to explain in your own words). You can re-invite the person you disconnected from, in which case the connection will be fully restored as if you never removed them. Now that you know how to delete connections on LinkedIn, you should have the confidence that should, for whatever reason, you want to delete one of your LinkedIn connections, the option is there. And it is easy to do as well. Looking for more advice on LinkedIn? Check out my blog post on LinkedIn profile tips or download my new free ebook Maximizing LinkedIn for Business. How do I get ride of LINKEdln totaly ? You will have to delete your account, which you can do on LinkedIn.com. If you don’t know how to, please contact LinkedIn Customer Service. Glad I’m not the only one. The reason it’s being asked all the time, is because it’s not very bloody obvious how to do it. I’ve searched and searched several times and STILL can’t work out how to do it. It’s a bit worrying that this social media platform, designed to connect PROFESSIONALS, can’t even take care of something as basic as Unconnecting with someone. If it was simple, the question wouldn’t be asked all time would it? Thanks for this blogpost. Google easily suggests “linkedin how to unconnect” and it leads to this post – obviously, people are asking for it. And as many other says – it should be on the screen where I see someone’s profile. That other way – “go and find the function, then select what you want to do that function with” – reminds me older Nokia mobile phones that had functions split to those that were available contextually and to those that you had real trouble to use (although you needed them quite often). Very silly indeed. You’re very welcome – I’m only sorry that LinkedIn doesn’t make it easier for everyone! The problem with that “Remove Connections” link is that it could possibly mean “Remove All of My Connections”. I do this sort of thing for a living (find navigation errors where users will be afraid or not understand where to go and why). LinkedIn product managers should change that to something like “Remove a Connection” or otherwise make it clear that clicking on that link won’t delete all your connections at once and irrevocably. This may seem funny but, if LinkedIn was a smaller company or an eCommerce company, this kind of awkward phrasing could mean everything. Excellent advice – we can only hope that the powers that be are listening! If you don’t see it you should contact LinkedIn Customer Service. Useless advice, since there is no “Remove Connections” link. Better luck next time. Yes – without them knowing it! When you remove the contact from your list are you likewise deleted from their list? Thank you for your informative article. I looked up this information month’s ago and even the FAQ’s on Linkedin said it wasn’t possible. the information you provided was very useful. I appreciate it. You’re very welcome Lori! If you have a burning LinkedIn question that hasn’t been answered elsewhere, please let me know so that I can write a blog post on it! Thanks! I am not a linked in member but foolishly i agreed to be linked in to just two other people, now I keep getting requests and wate of time emails from these two people of who they are linked in with. I want out. How do I get of this roundabout???????? Go to your LinkedIn account settings and cancel your account – or disconnect from those connections of yours! I understand a connection can “disconnect” from your connections list. Can that same person delete a letter of recommendation they previously sent to you and was posted on your profile? It appears a letter has disappeared from a “disconnection” of mine. My feeling is once someone gives you a letter, it belongs to you, not only the writer. Please let me know how I can retreive this letter. Thanks. Under the current LinkedIn paradigm, that is not possible. And if you think about it, you normally are disconnecting from someone for a reason, no? OK so what if you want to disconnect from someone, but you want 'them' to have the option of reconnecting…? Actually they both lead you to the same screen, so either one will do! The “Connections” screen? You mean “Contacts” on the left hand side of the screen? I am an open networker and will accept your invite! Please feel free to send me an invite! And if I can help you out any way let me know! Both of you are very helpful for the new LinkedIn user. Especially clear out all those cynical views on social networking. I like to connect to both of you. If I just send a simple invite, what will be the msg I will get? This is not so. YOU CANNOT re-invite the person after disconnecting. Exectly I do how to remove some connection. Unless things have changed recently, I was able to do this for one of my connections just a few months ago. Have you experienced this recently? Exactly! I just searched this question, not because I feel I’ll break someone’s heart as the article seems to suggest, but because it’s not obvious how to do it. Thanks Michelle – since the user interface has changed I owe you all a new blog post – coming soon! This is no longer an option there is no “remove connection” on there any longer. Hi Amy, thanks – I confirmed that at some point recently LinkedIn removed the ability to remove a connection directly from their profile. They might reinstate that link at anytime, but until then you can still remove connections from the Connections application. I confirmed that the “Remove Connection” link is still active there. You are bang on. 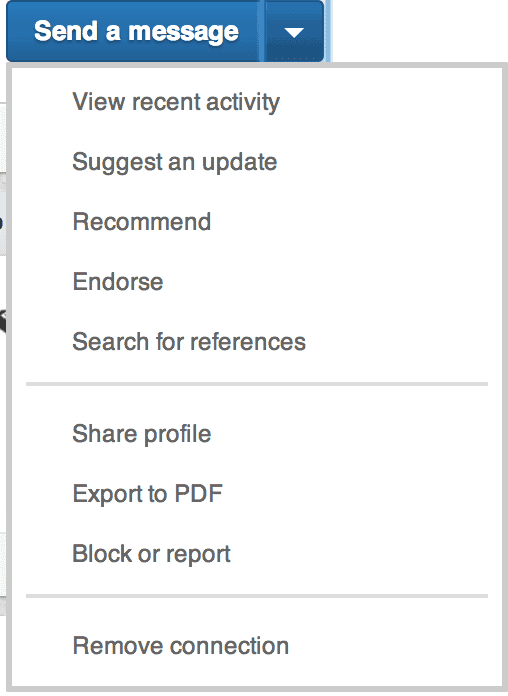 I think LinkedIn really needs to revamp the entire User Interface. There is too much bouncing around different screens in order to accomplish something on LinkedIn. This definitely contributes to the poor user performance that we feel everyday. Not to mention that you can’t delete your Inbox messages, leading to more data in the servers than LinkedIn needs. Definitely time for an overhaul. On a separate note, it is an honor to receive a comment from you on my blog. “I Am Not a Number” is a classic article in Networking circles. I often blog about the “virtual network” which is an extension of your “virtual handshake”. Thank you and looking forward to further communications with you!